Honduran migrants who are traveling to the United States as a group, get a free ride in the back of a trailer truck flatbed, as they make their way through Teculutan, Guatemala, Oct. 17, 2018. A couple of Honduran migrant mothers carry their children as they continue on their trek to the United States, in Teculutan, Guatemala, Oct. 17, 2018. 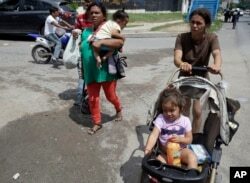 In neighboring Guatemala, where their journey continued Wednesday amid warning tweets from President Donald Trump and other U.S. officials, they were helped at every turn by residents who offered them food, water and rides in pickups or on flatbed of semi-trailer trucks. Honduran migrants who are traveling to the United States as a group get food from a a group of volunteers in Teculutan, Guatemala, Oct. 17, 2018. Henry Tejeda, who hails from Puerto Colon, Honduras, stopped at the side of a highway in the eastern department of Zacapa along with a group of women and children to ask for money. From a car a man tossed a 10-quetzal bill, worth about $1.30, saying, “So you can eat.” In all, Tejeda scraped together the equivalent of about $2, enough to get a bite. 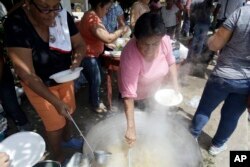 Marta Julia Veliz, a Guatemalan, organized with about 20 neighbors in Teculutan, Zacapa, to cook in the street for migrants. They served up beef broth, rice, tortillas and coffee to migrants passing on foot who paused for refreshment at the impromptu oasis. For those who didn’t get down from vehicles, the volunteers tossed them water, bread and toilet paper. 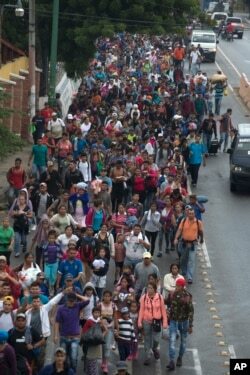 Honduran migrants walking to the U.S. start their day departing Chiquimula, Guatemala, Oct. 17, 2018. Their hope is that traveling in numbers protects them from robberies, assaults, extortion and other dangers common to the northward migrant route.